Acorn Hill Academy: The Pizza Bible: Learn to Make Great Pizza! I love pizza. At my house, we have pizza for dinner almost every Friday night. Sometimes we get to order out, and I love that, because I don't have to cook. However, most of the time, I make the pizza, so I'm always on the lookout for good recipes, tips and tricks. 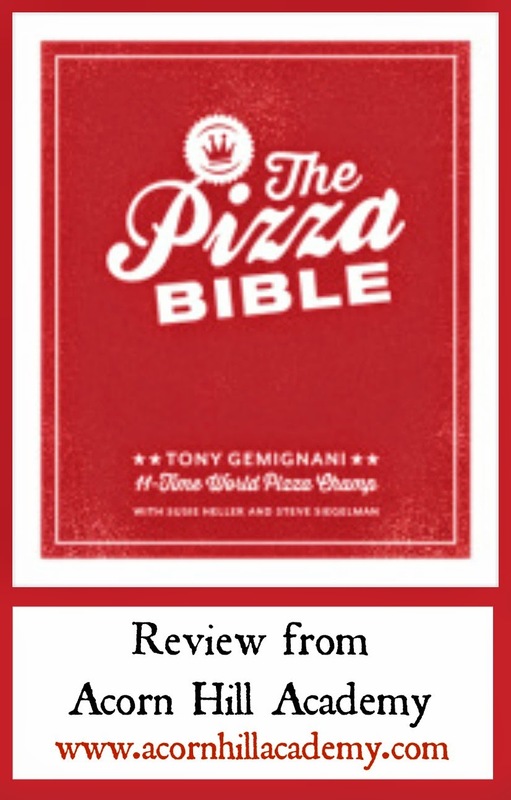 BloggingforBooks.org sent me a copy of The Pizza Bible by Tony Gemignani for review, and I'm excited to try out his methods. He owns seven restaurants, co-owns the International School of Pizza in San Francisco, and has been making pizza for 20 years. I'd say he's qualified to teach people how to make good pizza! When the box with my book arrived, I had no idea what was in it. It was heavy! I thought, "Wow! The only things I'm expecting are a couple of books to review. What on earth is this?" It was my Pizza Bible. Goodness. I'd be tempted to get the Kindle version of this one, because it's a monster. On the other hand, it's a beautiful book with fabulous pictures, including instruction images. As a visual learner, I appreciate the photos, and while I know they'd still be there in an ebook, I like having this cookbook in my hands, big as it is. The one issue I have, aside from the weight of the book, is that the cover is made of porous paper. If I spill something on it when I'm working in the kitchen, it will most certainly stain the book and I won't be able to wipe it off. I don't like that. Mr. Gemignani has assembled an impressive collection of recipes in his cookbook. He has regional American, Chicago style (both deep-dish and cracker-thin), Sicilian, California style, Napoletana, regional Italian, global, grilled, wrapped and rolled, and focaccia and bread pizza recipes. I have to believe there is something in here that everyone will like! I am personally most excited about the "Detroit Red Top" recipe, which is the style made at Buddy's Pizza, our favorite pizza place in Dearborn, Michigan (where my husband grew up). I have two blue steel pans on order and am anxiously awaiting their arrival so I can try my hand at making some! Tony discusses three things that help you make great pizza : ingredients, tools, and time. The most surprising thing to me? He says pizza dough needs to rise slowly, in the refrigerator, for 36-48 hours. That's going to require some significant changes in my pizza-making routine. I guess I will have to schedule dough making on Wednesday if we want to have it for dinner on Friday. If you're interested in learning to make great pizza, you have to give this cookbook a try! Disclaimer: I received a copy of this book from BloggingforBooks.org in exchange for my honest review. No other compensation was received. I am disclosing this information in accordance with FTC regulations.